Garje Gajraj Humare Full Song Lyrics with English Translation and Real Meaning Explanation from upcoming Bollywood movie Junglee (Junglee means Wild), the groovy track has been composed by Sameer Uddin while Kumar Suryavanshi penned this elephant praising song, Navraj Hans, Hamsika Iyer, Abhishek Nailwal & Gulshan Kumar sang this song. 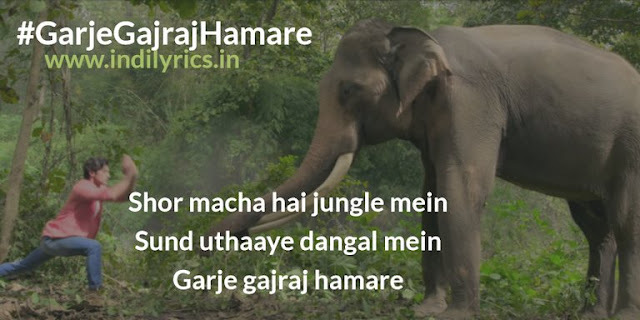 The movie Junglee stars Vidyut Jammwal, Pooja Sawant & Asha Bhat, the audio mp3 version of Garje Gajraj Hamare song is free to download and stream from Gaana, Wynk, JioSaavn and other online music portals. This song is an elephant praising song, explaining how they are so different from other animals and how friendly and loving they are to those who are animal lovers.